Noel Kelly's Kids - Munch,Music and Memories 2014. Mick Liubinskas welcomes everyone to the 2014 Munch, Music and Memories Gala. Micks view of the packed room. Almost 100 guests. (why the dance floor?) Geoff Squires, Jill Squires and Wayne Kirby. Jock Allison, Barry Glasgow and Judy Glasgow. Garry Walsh. Jan Malone, Jill Squires and Lottie Hooper. Jan Dhu and Sandra Ross. A very happy table 3.Lots of good memories at this table. Left - Right. Lorraine Hooper, Joan Reid, Hazel Holman, Betty McLean, Merrilyn Rogers and Joan Horder. Jan Malone, Don Malone, Anne Russell and Ray Mc Neilly. Now we know why the dance floor. Elvis has arrived. Elvis working the big crowd. I think Elvis is singing to me?? Wrong...it was Merrilyn Rogers. Also at the table are James McWhinnie and Norma Murphy. Helen Dillon and Elvis look alike Paul Dillon. Two more Elvis fans Ken Stonestreet and Tim Murphy. Nebo in Easts colors 1966 Table 10. Left -Right. Harry Wells, Chris Kelly, Ned, Bob Paxton, Gai Paxton Dexter Dunworth. Ned trying to calm down Tommy Bishop. Table 1 a very noisy crowd. Right to left Jim Mahon, Margaret Mahon,Robyn Seaward, Veronia Maclean andThe Riccardi Family. Carl Ross, Roy Ferguson and Don Malone. Don 'Irish'Malone played Halfback in 1962 Grand Final. 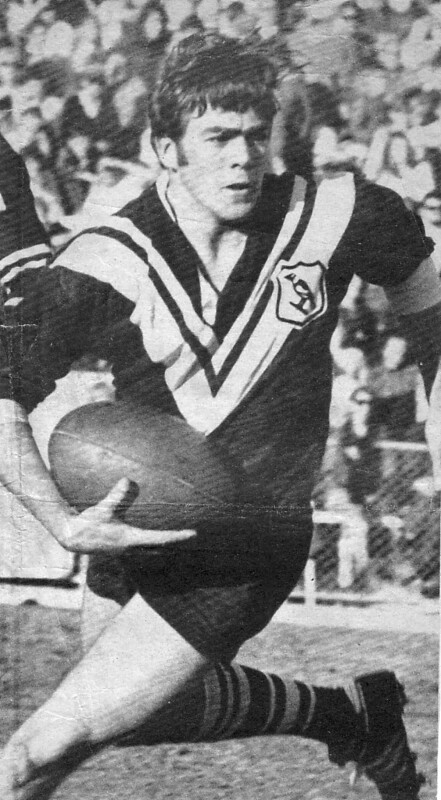 Carl Ross played Halfback in the 1962 Reserve Grade Grand Final Table 7. L-R Ted Balkin, Jock Allison, Barry Glasgow, Judy Glasgow and Liz Stonestreet. Table 5. Left to right - Ron Powell, Carol Powell, Marica Stipanovic and John Hardgrove. Alan Davidson and Mike Bailey. Merrilyn Rogers and Bev Watson having a great time. The late Don Rogers.Don was a flying winger who played for Wests between 1969-72. Don then went to Canterbury for two years 1973-74. During his time with the Berries Don scored 11 tries. Don Rogers in full stride. Don came back home to Lidcombe Oval in 1975 and played for Wests for 2 more seasons. Don Rogers played 100 First grade games for Wests and scored 43 tries. Barry Glasgow, Roy Ferguson and Ken Stonestreet. Roy on the run 1970.Thats 44 yers ago. Roy played for the Maggies between 1964-71. Playing in almost 100 First grade games. Roy moved to St George and played 100 First grade games for them. Roy Ferguson in the famous red V of Saints. Don Malone, Carl Ross and Anne Russell. Don a few years early taking on Big Norm Provan. Thanks to the Pratten Park Magpies committee for putting on such a wonderful event. The food,drink and entertainment were first rate. (as always) Footnote: Somehow I missed Table 6 completely . Please forgive me I think I was having too much fun. But I will not miss you next year. Munch, Music and Memories Gala. Micks view of the packed room. Geoff Squires, Jill Squires and Wayne Kirby. Jock Allison, Barry Glasgow and Judy Glasgow. Jan Malone, Jill Squires and Lottie Hooper. Jan Dhu and Sandra Ross. A very happy table 3. Lots of good memories at this table. Merrilyn Rogers and Joan Horder. Jan Malone, Don Malone, Anne Russell and Ray Mc Neilly. Now we know why the dance floor. Elvis working the big crowd. I think Elvis is singing to me?? Also at the table are James McWhinnie and Norma Murphy. Helen Dillon and Elvis look alike Paul Dillon. Two more Elvis fans Ken Stonestreet and Tim Murphy. Ned trying to calm down Tommy Bishop. Table 1 a very noisy crowd. Carl Ross, Roy Ferguson and Don Malone. Don 'Irish'Malone played Halfback in 1962 Grand Final. Alan Davidson and Mike Bailey. Merrilyn Rogers and Bev Watson having a great time. 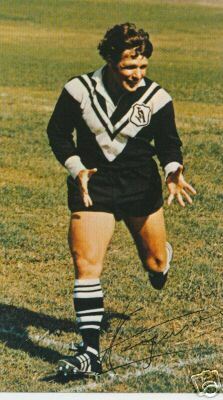 Don was a flying winger who played for Wests between 1969-72. Don then went to Canterbury for two years 1973-74. During his time with the Berries Don scored 11 tries. Don Rogers in full stride. Don Rogers played 100 First grade games for Wests and scored 43 tries. Barry Glasgow, Roy Ferguson and Ken Stonestreet. Roy on the run 1970. Roy played for the Maggies between 1964-71. Playing in almost 100 First grade games. Roy moved to St George and played 100 First grade games for them. Roy Ferguson in the famous red V of Saints. Don Malone, Carl Ross and Anne Russell. Don a few years early taking on Big Norm Provan. Thanks to the Pratten Park Magpies committee for putting on such a wonderful event. Footnote: Somehow I missed Table 6 completely . Please forgive me I think I was having too much fun. But I will not miss you next year.